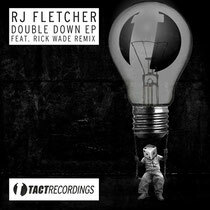 Manchester based DJ/producer Richard Fletcher launches a brand new label in the shape of Tact Recordings and kicks off proceedings with the 'Double Down EP' featuring a remix from deep house veteran Rick Wade. Richard has been causing a stir amongst deep house lovers over the past couple of years with a string of releases that have certainly made their mark. His EP alongside label partner [Aura] on Deep Edition Recordings was an outstanding debut, leading to releases on 3AM Recordings and the much-lauded Fear Of Flying imprint. Kicking off this latest EP is 'Double Down' a smooth, airy track with a classic house sound. The record opens with stripped, razor sharp percussion before blossoming into a warm and emotive groove built around rich looped pads, subtle but effective bass notes and a wonderful shuffling Hammond riff. For his remix of ‘Double Down’, Rick Wade jazzes up the original, adding his own analogue twist and signature swinging drum pattern to create his ‘Double Detroit’ re-interpretation. 'Over Defy' steps out of the deep house mould, showing Fletcher’s versatility as a producer as he delves into darker territory with a track that exudes an eerie atmosphere whilst retaining its dancefloor sensibilities. 'Finally we have digital excusive, ‘Lazy Days' which rounds off the package perfectly, offering up, as the name suggested, a laidback cut that utilises low slung drums and warm organic brass sounds to provide a sublime wind down record.